Overall I liked this book. I appreciated the different setting (at least different from most of the books I read). Also did I mention there’s an adorable (very smart) elephant? I love elephants. He was definitely my favorite character. I think the best thing about this book was that although it was all about the crown, there were also a bunch of subplots as well. 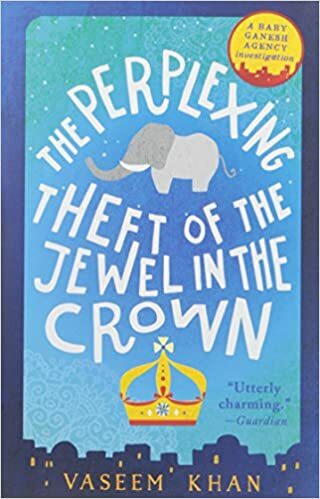 Inspector Chopra has his mystery to solve, his wife has different drama, the elephant and Irfan (the boy Chopra and his wife take care of) have their own story. Despite all this, I didn’t find myself confused at all or overwhelmed by the number of characters which is unusual. It was kinda odd to read about Chopra complaining about how the world is changing. I felt very much like I was in a old man’s head and I really did see the things that concerned him. The world has and continues to change rapidly and not always for the best. I don’t tend to read a lot of mysteries and although this was a mystery and I was engaged it wasn’t a super intense full of drama book which I appreciated. Also it was clean and just kinda different and a nice way to pass some time. Would recommend even if just for the setting and elephant.